This pristine little island is almost halfway to Culebra Island. ( We do NOT go to Culebra ). 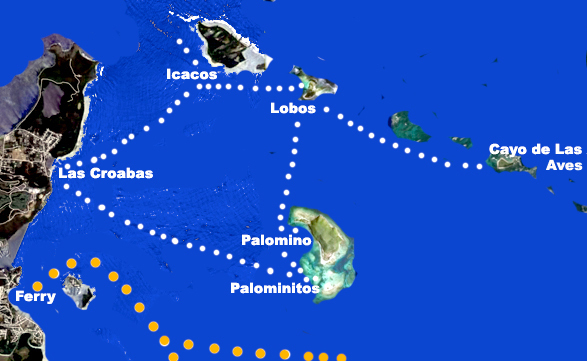 It is known as both 'Cayo de las Aves' ( bird island) or Cayo Diablo ( devils' island) farther towards Culebra than Lobos Key. This spot is more weather dependent than the others as it can be harder for boats to land here. The Booby birds nest on the rocks on the far side and need to be left alone. Bird watchers can easily see them when the season is right. Description from Cornell U. The Brown Booby is the only ground-nesting booby that regularly builds a substantial nest.. 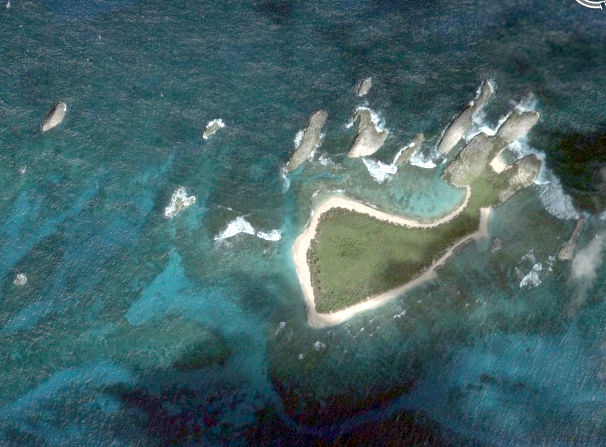 This island is the least visited of all the little islands in the Cordillera Reserve. The reefs are the most pristine, good for scuba as well. How can the water be so clear and clean? The water is truly amazing! This little island is rarely visited as it requires a private boat to get here and very calm weather. The anchorage is difficult, at best. Since there are so many birds nesting here, the island should not be explored too much The birds, during nesting season, are quite disturbed. The snorkeling can be excellent, so much depends upon which way the wind is blowing and how rough the ocean is.. On a calm, quiet day there is nothing like this sandy key, Cayo Diablo. How wonderful to spend a few hours by ourselves with no other visitors! * I made this video some time ago and have since lost that website, so the website shown on the video no longer applies.. * I have only kept this website. The map below makes it look easy to get to Cayo de Las Aves, but the seas are rougher going there and it has to be a calm day. Waves need to be 3-4 feet or less. We can decide whether to go or not once we are out there, from Lobos Island. Map shows route we take through the Cordillera Keys.